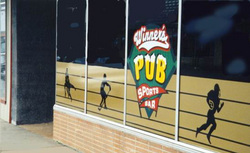 Sports athletes, teams, and coaches from around the area are featured prominently in the cozy atmosphere at the Winner's Pub, Sidney's newest sports bar. Sports enthusiasts enjoy the ten televisions that are always tuned to your favorite sporting events and broadcasts, featuring the NFL Sunday Ticket during the season. Stadium food is the fare served up at the Pub - hot or cold hoagies, chili dogs, pizza, nachos, and bratwurst are the favorites. Cold beer - domestic, imported, and micro-brews, wine, and soft drinks are available to quench your thirst. The Pub's private casino allows you to game in relaxing surroundings. Also available are the popular video golf and racing games as well as, trivia, pinball, foosball and soft tip darts. If you want to connect to the Internet we have wireless and high speed Internet for your computer needs. Come in and say 'Hello' at the Winner's Pub, we have a seat waiting for you. Directions: The Winner's Pub is located right in the heart of Sidney.